The talented cast of Something's Afoot. Photo: David Costa. 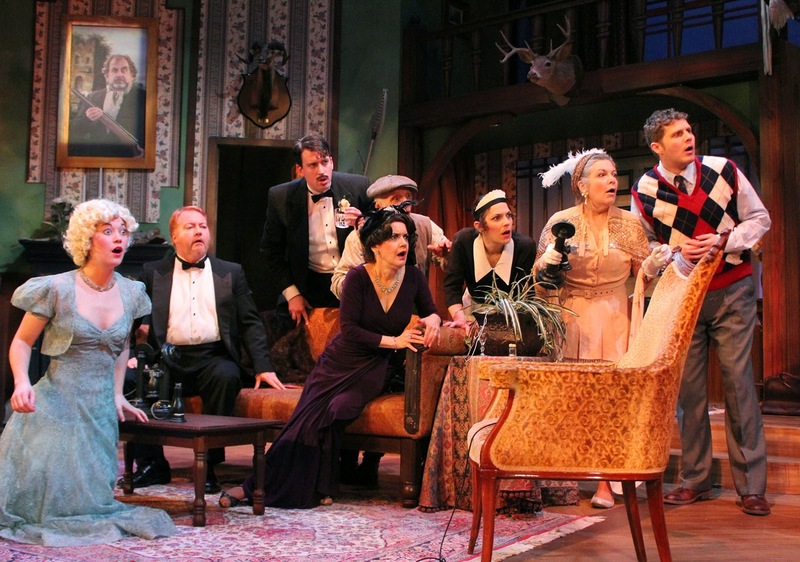 I did want to throw a rose to the cast of Something's Afoot (above), which closed its run at the Stoneham Theatre last weekend. I caught one of the last performances, because people had been nudging me to go, and I have to admit I did enjoy it, in a giggly girl's-night-out kind of way. Not that all that much is afoot in Afoot; this musical spoof of Agatha Christie and Arthur Conan Doyle is simultaneously broad and thin - very thin - and at times coasts on nothing more than our good will and low expectations. And honestly, the score isn't much better - it actually takes a couple of numbers before we get to a real song. But if great acting alone can't make great theatre all by itself, well - guess what; great low acting can indeed make great low theatre on its own power. And the Stoneham cast was full of the kind of ham you usually find only in the best delicatessens. Whatever the gag, these troupers ran with it - and since Afoot slowly picks off its entire cast, one-by-one, via various Victorian booby traps, this meant their finest hour oft came with their exit. Kathy St. George, for instance, threw herself into her improbable electrocution with hilarious abandon, while J.T. Turner turned his own death-by-poisoned-dart into an entire scene. But then everybody got a chance to chew the scenery before it killed them, for elsewhere on Jenna McFarland Lord's witty set lurked an explosive stair and a murderous chandelier; one actor was even eaten by an urn. They all should have known what was coming, though, as Lord had filled her design with mounted heads of big game, and even included a portrait of a mad patriarch brandishing his musket. This meant, of course, that there was little mystery to this mystery - but who really cared if there wasn't much "who" in this whodunit? Director Caitlin Lowans kept the accents reliably thick, and the tone reliably arch, and that's all that mattered. I was particularly taken with Margaret Ann Brady's hearty Miss Marple knock-off, "Miss Tweed," and Stephanie Granade's wittily poised turn as heartthrob Hope Langdon proved her IRNE nomination for Thoroughly Modern Millie was no fluke. But honestly, the whole team was strong; if you ever find yourself invited to a lonely mansion by a murderous madman, this is the crew to take with you.